“Library Space is Community Place”: A Retrospect on the Success Story of the Relocation of London Public Library’s Central Branch | The Incubator. Picking up my London Public Library card. On August 15, 2002, a sprawling human chain of close to 2,000 volunteers passed books hand-to-hand off the old shelves of the London Central Library to its new home (Gillespie, 2002). As a ceremonial effort to involve the public in the central library’s relocation, the chain wound from 305 Queens Avenue, north following Wellington Street, west along Dufferin Avenue and south at Clarence Street into the new facility in Galleria London at 251 Dundas Street (McGregor, 2002). While a 1878 Historical Atlas of Middlesex County was the first book being transferred, local bagpiper Natasha Ohler (who also worked at the library’s circulation department) was piping The Land of My Youth alongside (Gillespie, 2002). The activity was geared to drum up community spirit around the move and served as a powerful literal illustration of enthusiastic support for the library. By linking and engaging the community to its history (Goodden, 2002), the event enabled the community to come together and participate in actively shaping the future of Downtown London the hands-on way. What “a moving experience” indeed as the title suggested in Ian Gillespie (2002)’s news article! Having recently moved back to my hometown London, Ontario, I cannot help but to notice the dramatic transformation happening in the city centre and London Public Library’s Central branch, I believe, has made a significant impact on the revitalization of the downtown core, not only through its architectural space, collection and programming but more importantly, through its vision and engagement. Back in 1999 when the Bay announced its plan to vacate, the Galleria Mall had already been in decline as a retail venue for several years. Unanimously backed by the library board while receiving an overwhelming support from the city council (Goodwin, 2003), the library bought the building for $5.2-million (Weiler, 2002). In the subsequent public consultations, citizens expressed tremendous interest and opinions on the new library’s architecture and design. Envisioned as a solution for growth and an investment opportunity rather than a budget burden, the business community was brought in as partners. Synergy was felt across different sectors and significant fundings were raised for the new library’s performing centre, high-tech meeting rooms, music practice rooms, media literacy centre, reading garden and café (Weiler, 2002). The new $26-million building was officially open on August 25, 2002 and 7,200 visitors flocked in for the 3-hour open house (Coulson, 2002). The public was consulted on what it wanted in a library and the library board listened. New technology and staff creativity. The community caught the imagination and enthusiasm generated by the new facility. What I find most intriguing is that two out of the three factors require the direct involvement of the community. A successful library is always a two-way street where the users not only take advantage of what is available, be it a book of fiction or a resume workshop, at the library but also invest their time, money (donations or tax dollars) and appreciation so that they care enough to make the library a better place for themselves. just a neutral location or an abstract point on a map. Space is not really anywhere in particular until it is infused with some narrative or lived experience. This infusion of shared events and social practices – of rituals, traditions, or even the smallest joyful disruptions from daily routines – are what it takes to turn spaces into meaningful places; this is what it takes to turn anywhere into somewhere. Despite all the technological advances, rates of circulation and library visits keep increasing. In my opinion, it all comes back to Wayne Wiegand’s idea of “library as place” (2005) where libraries worldwide are serving a multiple role of community hubs instead of just collections of items. Beyond providing access of information and reading materials, the notion of “library in the life of the user” (Wiegand, 2005) suggests a paradigm shift away from Jurgen Habermas’ concept of public sphere (1989) and to pay closer attention in engaging the private lives and aspirations of the library patrons, customers, users, clients (Auld, 2004) or members (Molaro, 2012), however they would like to define themselves. “Library in the life of the user” means tailoring to user’s needs and responding to user’s suggestions and concerns. With this user-focused approach, libraries will go where the users are, embedding themselves into the community as key infrastructures and “soft location factor” to help create a “knowledge society” (Mainka, 2013). As a two-way partnership, users are engaged with mutual respect where mutual acceptance and learning blossom. At times, a library can be a friend to have fun with. It can be a “playing field for citizenship” (Schudson, 1998) or a “place where the community can find and share and play with ideas” (McLeod, 2004). A library can also be a mentor who provides support and guidance and would stand up for the users at times. “For the users, with the users” could be a reasonable guiding principle. There are information sharing, knowledge creation and personal empowerment. The possibilities are endless and it is “essential to understand how library patrons use this public space in their everyday lives” (Wiegand, 2005). What does each community require? How can a library assist local citizens to become more engaged? 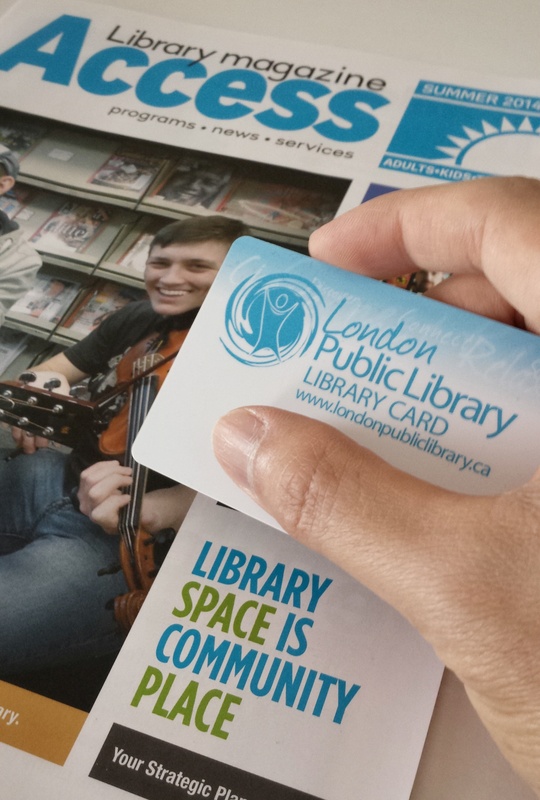 Like every time I move to a new city, the first thing I did when I moved back to London, Ontario was to pick up my London Public Library card, even before I updated my driver’s license! On my first visit, I flipped through the library magazine ACCESS to see what programs were available and that was where I came across their latest strategic plan titled “LIBRARY SPACE IS COMMUNITY PLACE”. Personally, it is more than a slogan. It is a vision, a way to welcome the community, a way to tell me that I have the agency to make the library my space. Sitting inside the glass-ceilinged London Room up on the third floor at the Central branch researching the archival material for this essay, I felt a tremendous sense of connection and belonging. I, for one, am totally looking forward to discover what the City of London has to offer as a community via its public library. Auld, Hampton (Ed.) (2004). Patrons, customers, user, clients: Who are they and what difference does it make what we call them? Public Libraries 43(2), (March/April), pp. 81-87. Coulson, Sandra. (2002, August 26). Library opening a hit. The London Free Press, pp. A1-A2. Gillespie, Ian. (2002, August 16). A moving experience. The London Free Press, pp. B1-B2. Goodden, Herman. (2002, August 19). Library chain links us to the past. The London Free Press. Goodwin, Carol. (2003, August 23). Exploring all the options: As Kitchener and Waterloo study library expansion, London sets its own example. The Record, pp. J1-J2. Habermas, Jurgen. (1989). The structural transformation of the public sphere: An inquiry into a category of bourgeois society. Cambridge: Harvard University Press. Library wins city’s heart. (2003, May 25). The London Free Press, p. I8. Mainka, Agnes, Sarah Hartmann, Lisa Orszullok, Isabella Peters, Anika Stallmann and Wolfgang G. Stock. (2013). Public libraries in the knowledge society: Core services of libraries in informational world cities. Libri 63(4), pp. 295-319. McGregor, Jennifer. (2002, July 30). Library seeking helping hands. The London Free Press, pp. A1-A2. McLeod, Philip. (2004, October 14). Tomorrow’s library: A place to play with ideas. The Londoner, p. A3. Schudson, Michael. (1998). The good citizen: A history of American Civic Life. New York: The Free Press. Weiler, Derek. (2002, May). An Ontario library’s unusual new home. Quill & Quire, p. 20.